Sunday morning political shows’ coverage of climate change in March was driven by Democratic presidential candidates, a number of whom are making climate change a key campaign issue. The five major Sunday shows aired a combined six segments in March that included substantive discussion of climate change, and all of them were interviews with 2020 hopefuls. The two most in-depth climate conversations came during interviews with Washington Gov. Jay Inslee, who is focusing his presidential campaign around the need for climate action. Inslee appeared on the March 3 episode of ABC’s This Week with George Stephanopoulos and the March 10 episode of CNN’s State of the Union. 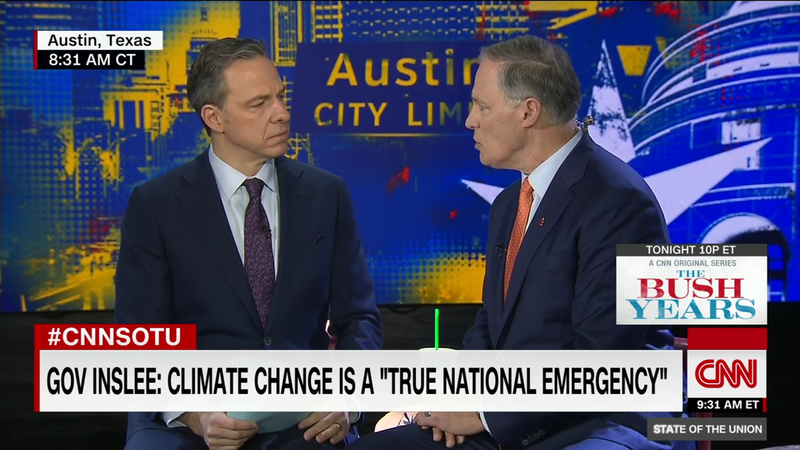 On State of the Union, Inslee gave a detailed response to host Jake Tapper's question about the seriousness of his climate-focused candidacy, discussing the severity of the climate threat, how high climate change ranks among issues voters care about, and how climate issues intersect with other issues such as the economy, health care, and national security. JAKE TAPPER: So let's talk about climate change. First of all, what do you say to a Democratic voter who hears that your campaign is about climate change, and they think, “Oh, well, then he's not really serious about running for president, he's just trying to get an issue on the agenda”? JAY INSLEE: I would say several things. Number one, I would say that we are the first generation to feel the sting of climate change, and we are the last generation that can do something about it. And we have got one shot. And that's the next administration. We have to have this be the primary, first, foremost, and paramount duty of the next administration, because the world's on fire. And we’ve got to act. And we got a climate denier in the White House. The second thing I would say is: If you care about climate change, you're not alone. A poll just came out in Iowa saying it's the top, number one priority, tied with health care. And the third is, this is not a single issue. It is all the issues. Look, if you care about the economy, the economy is now being ravaged by climate change. And the economic growth that we can have -- I’ve been on a tour looking at all the job creation going on, solar power in Iowa, batteries in Nevada, wind power in Washington. So, I have been on this tour, nationally, looking at what a tremendous job-creating opportunity this is. It's a health issue. It's asthma and infectious diseases. It's a national security issue. I met with Adm. [William] Fallon in Seattle, who talked about the Pentagon telling us what a national security threat it is and how we have Trump trying to tear up the intelligence report. Other Democratic presidential candidates who discussed climate change on Sunday shows last month included Pete Buttigieg, mayor of South Bend, IN. On the March 17 episode of Fox News Sunday, host Chris Wallace asked him about the Green New Deal and Buttigieg responded by emphasizing the need to "act aggressively and immediately on climate." Massachusetts Rep. Seth Moulton, who is considering a run for president, appeared on the March 31 episode of State of the Union, where Tapper asked him about the Green New Deal's job guarantee. Moulton said the U.S. could fight climate change and strengthen the economy at the same time by putting people to work doing things like making buildings more energy-efficient. Minnesota Sen. Amy Klobuchar and former Colorado Gov. John Hickenlooper both discussed climate change during appearances on NBC’s Meet the Press, even though host Chuck Todd didn’t ask them about the subject. During her March 17 interview, Klobuchar talked about the economic consequences of climate change and extreme weather, noting the role climate change played in the recent devastating flooding across the Midwest as well as in hurricanes and wildfires. On the March 31 episode of Meet the Press, Todd asked Hickenlooper how he would respond to critics of his fossil fuel ties, and Hickenlooper used the opportunity to talk about methane regulations he helped put in place in Colorado and the need for global action to tackle climate change. CBS' Face the Nation is the one major Sunday show that failed to air a single substantive discussion of climate change in March. It was the fourth month in a row that the show neglected to cover climate change. The number of segments that included substantive discussion of climate change was down a little in March compared to February, when many of the shows included conversations about the Green New Deal; there were six substantive segments in March versus seven in February. In January, the Sunday shows featured no substantive discussions of climate change. 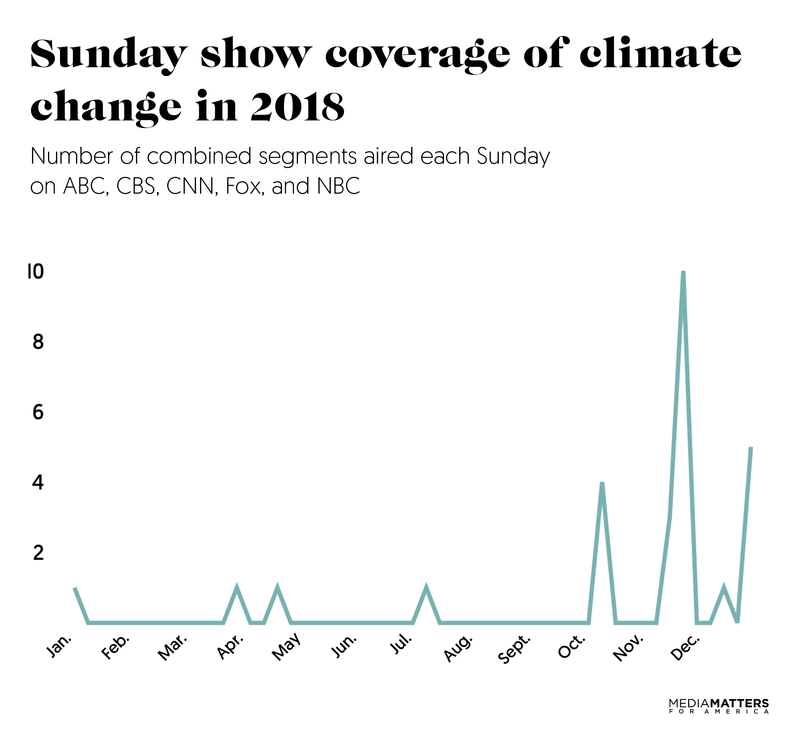 Altogether, the first quarter of 2019 featured much more climate coverage than the first quarter of 2018, in which the Sunday shows aired just a single episode that included notable discussion of climate change. But climate coverage in the first quarter of 2019 was actually down compared to the last quarter of 2018, when the Sunday shows discussed climate change in the wake of two major reports on climate science from the U.N. Intergovernmental Panel on Climate Change and the U.S. government. 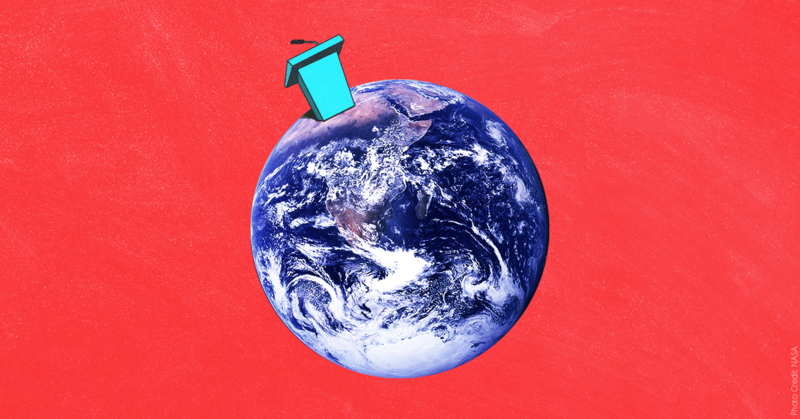 In March, the shows missed opportunities to engage in meaningful conversations about climate change beyond interviews with Democratic presidential contenders. None of the shows' hosts asked questions about the historic and calamitous Midwest flooding that took place last month; Klobuchar is the only person who brought it up. The Sunday shows even failed to address the political maneuvering around the recent Senate vote on the Green New Deal, which is an odd omission for programs that are normally so focused on political fights and one-upmanship. The shows still have work to do to increase the quality and quantity of their climate coverage. All five major Sunday morning political shows touched on the Green New Deal on February 10 -- the first time in 2019 that any of the programs have addressed climate change with more than a passing mention. But most of the discussion was superficial and narrowly focused on whether the Green New Deal will cause intra-party fighting among Democrats or end up benefiting Republicans, not on whether its policy ideas are good approaches for fighting climate change. Rep. Alexandria Ocasio-Cortez (D-NY) and Sen. Ed Markey (D-MA) introduced a Green New Deal resolution on Thursday, outlining an aggressive plan for achieving net-zero greenhouse gas emissions in the U.S. within a decade. The U.N. said we have 12 years before complete disaster. You talk to the representative of the Marshall Islands, and he's calling it what could amount to genocide if we allow things to go as they are. The reports aren't just, "Hey, it's going to get bad." The reports are, "People will die. Millions and million, and millions of people will die." And I think that there is an appetite among voters out there, especially Democratic voters and potentially swing voters, to say, "Hey, let's do something about this now because it's, it’s going to affect our future." And there's real economic damage that can happen as well. Billions of dollars in economic damage from crops to deaths, to losing oceanfront homes and businesses in, over the next century. On CNN's State of the Union, host Jake Tapper brought up the Green New Deal twice. His interview with Peter Buttigieg, Democratic presidential hopeful and mayor of South Bend, IN, included a substantive exchange on the plan and on climate impacts. Tapper briefly mentioned the Green New Deal’s broad aims, questioned Buttigieg about how it could affect his constituents and industry in the Midwest, and asked if he endorsed it. Buttigieg affirmed his support for the general framework of the Green New Deal, specifically “the idea that we need to race toward that goal and that we should do it in a way that enhances the economic justice and the level of economic opportunity in our country.” Buttigieg also noted that action is needed because extreme weather is already hurting Americans. Later in the show, during an interview with Sen. Chris Murphy (D-CT), Tapper noted that Murphy was a Green New Deal co-sponsor before saying, “Independent senator Angus King of Maine as well as Obama's former energy secretary Ernest Moniz say they don't think that this plan is realistic.” Murphy responded, “It's absolutely realistic and I frankly think we need to set our sights high.” Murphy emphasized the reason why bold steps are required: "Global warming is an existential threat to the planet." Both ABC's This Week with George Stephanopoulos and CBS' Face the Nation just made passing mentions of the Green New Deal. This Week host Stephanopoulos directed a comment about Trump’s sarcastic tweet about the Green New Deal to ABC News contributor Chris Christie, but Christie didn't address the topic. Face the Nation host Margaret Brennan didn’t bring up the Green New Deal herself, but one of her guests, National Review Senior Editor Jonah Goldberg, referenced it in passing to claim that it could harm the Democrats politically. Sunday’s Green New Deal coverage did not include any guests who voiced climate denial, which is an improvement over the last time all of the major shows covered climate change, on November 25, after release of the National Climate Assessment. But this time around, none of the shows hosted guests with particular expertise in climate change to discuss the plan, like climate scientists or environmental journalists. This is an unfortunate, long-running trend: The Sunday shows rarely feature climate experts. The Green New Deal is sparking Sunday show discussion of climate policy, which we've seen very little of in recent years. (And it’s freaking out conservatives and right-wing media figures.) But the coverage needs to get better. 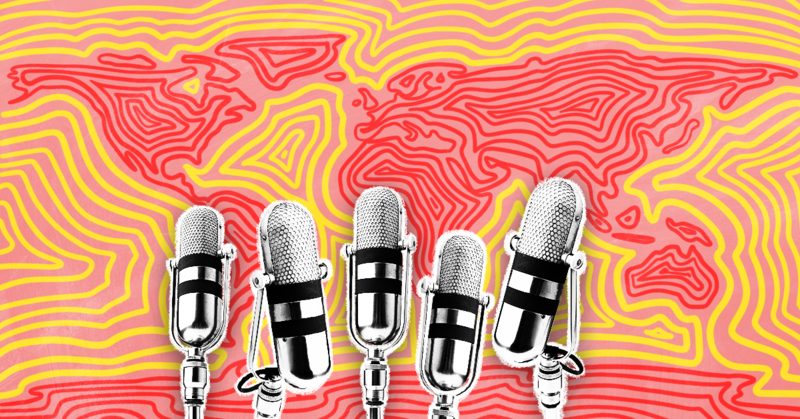 Media outlets have a responsibility to move discussions of climate-related issues like the Green New Deal beyond superficial horse-race coverage and into real substance. That means acknowledging that the Green New Deal is not merely a political ploy; it is an effort backed by a broad array of environmental groups, environmental justice organizations, and unions, as well as high-profile Democratic politicians, to comprehensively address the climate crisis. Sunday shows should be fostering discussion of whether the Green New Deal is the right approach to deal with climate change, not whether it will help one side or another score quick political points. Less than 6 percent of episodes of the five major Sunday morning news shows in 2018 featured any substantial mentions or discussions of climate change, according to a Media Matters analysis. And the number of times the shows addressed climate change was down from the previous year: They ran 13 percent fewer climate-focused segments in 2018 than they did in 2017, continuing the shows’ multi-year trend of neglecting climate change. The Sunday shows also continued their trend of failing to adequately represent minorities, women, scientists, and environmental journalists in discussions about climate change. 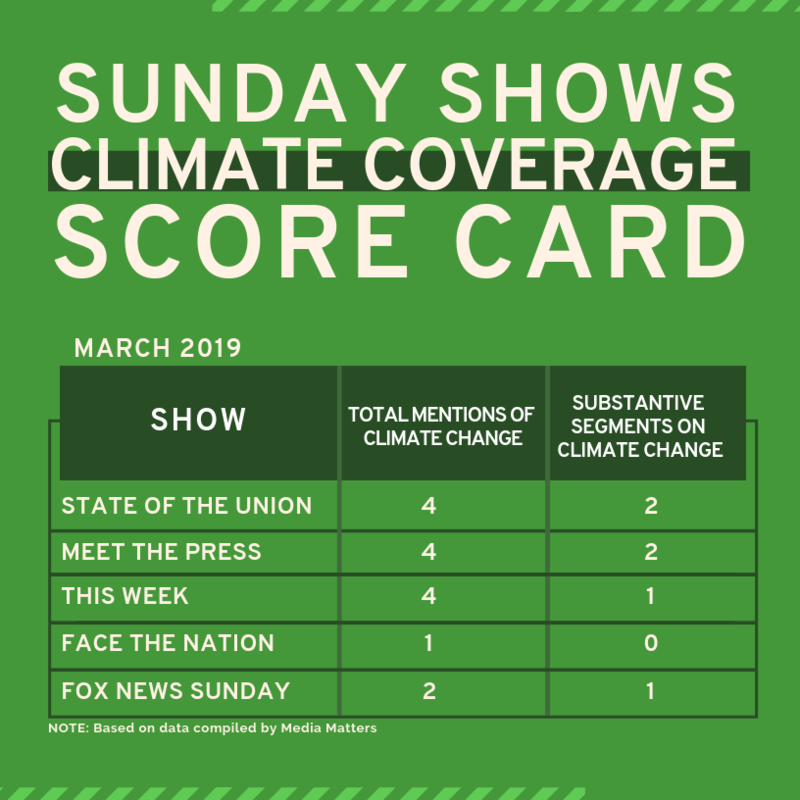 Media Matters analyzed climate change coverage and guest appearances on the five major Sunday morning shows: ABC’s This Week with George Stephanopoulos, CBS’ Face the Nation, CNN’s State of the Union, Fox News Sunday, and NBC’s Meet the Press. The Sunday shows help set the media and political agenda for the week, but it's not only politicians, pundits, and other media figures who take their cues from them -- members of the public do too. The four broadcast Sunday shows attracted a combined audience of nearly 11 million viewers in the last quarter of 2018. Because of their wide viewership and political prestige, Sunday news shows play a crucial role in determining which issues and voices are included in the national dialogue. 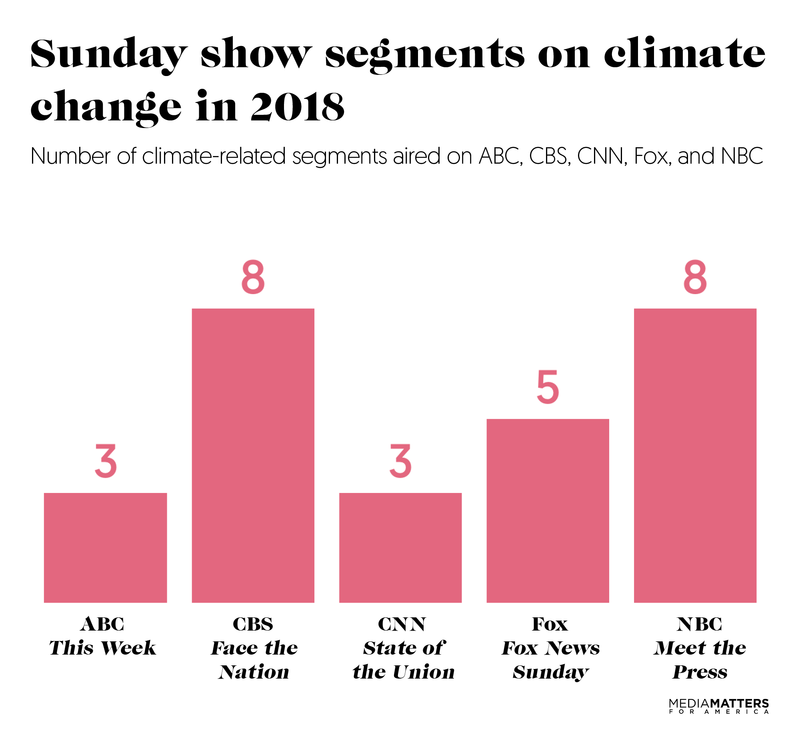 Less than 6 percent of episodes of the major Sunday shows in 2018 featured significant discussion of climate change. Sunday shows ran fewer segments that included substantial mentions of climate change in 2018 (27 segments) than they did in 2017 (31 segments) -- a 13 percent decrease. 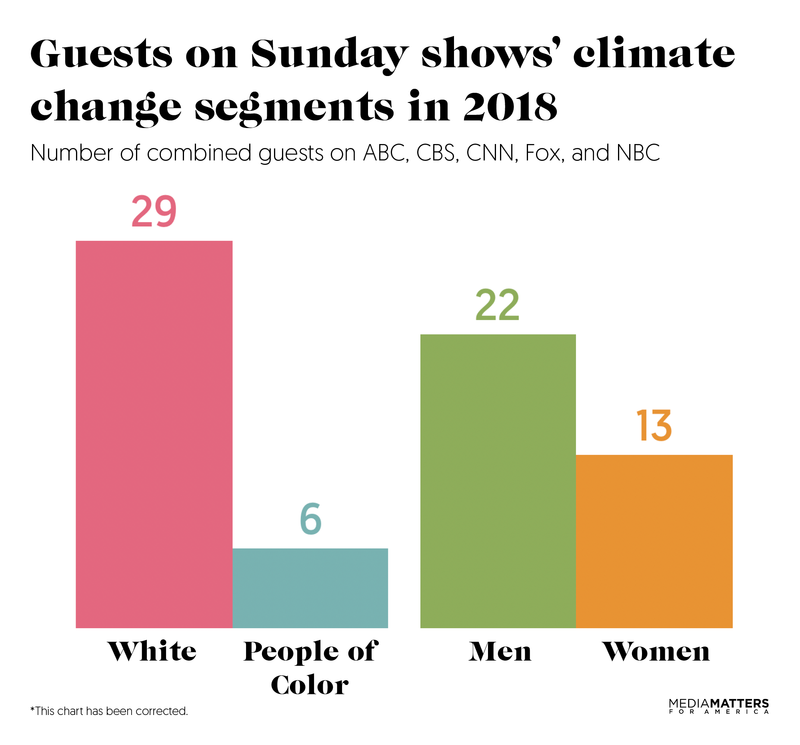 Only 17 percent of guests featured during climate-focused segments in 2018 were people of color -- six out of 35 guests total. Only 37 percent of guests featured in climate-focused discussions in 2018 were women. Two scientists were included in climate-related segments in 2018, after scientists had been excluded from all of the Sunday shows' climate discussions for almost three years. In 2018, the five major Sunday shows aired a combined total of 256 episodes, and only 14 of them made significant mention of climate change -- less than 6 percent. During the course of the year, there were only nine Sundays when at least one show aired a segment that focused on climate change. On the other 43 Sundays, or 83 percent of them, climate change was not substantively addressed. The shows also neglected to cover climate change during six months of the year, including June, when a heat wave broke records across much of the U.S.; August, when the Mendocino Complex became the largest fire in California’s history; and September, when Hurricane Florence devastated parts of North Carolina. When the Sunday shows did air climate-focused segments, the discussions were dominated by white men and unrepresentative of America's population. Of the 35 guests featured during climate-focused segments in 2018, just six were people of color, or 17 percent. This is a slight improvement from 2017, when only four out of 35 guests on climate segments were people of color, or 11 percent. New York Times journalist Helene Cooper and then-Rep. Carlos Curbelo (R-FL) on Meet the Press. 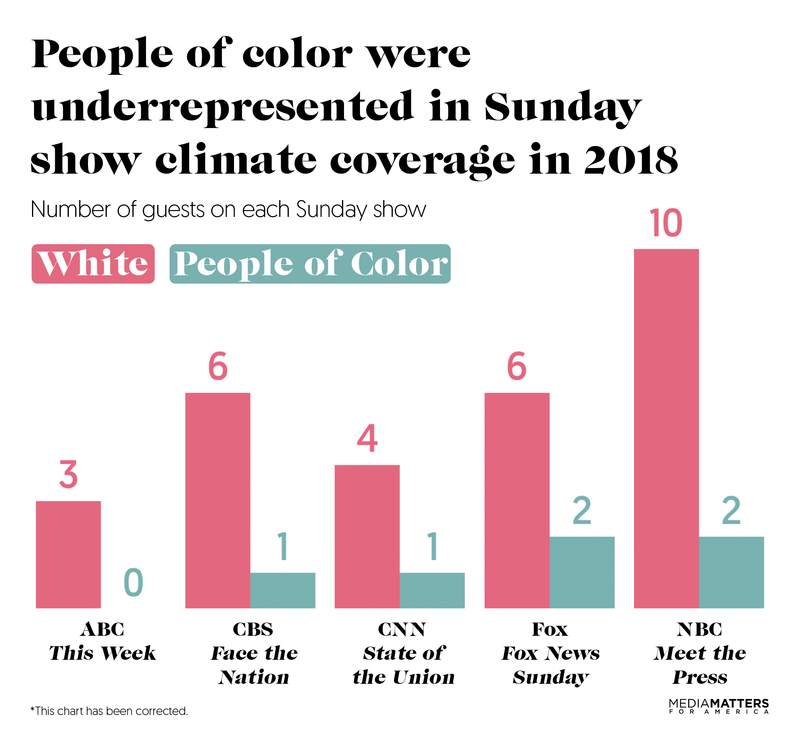 ABC’s This Week was the only Sunday show that did not host a guest of color during one of its climate-focused segments. The underrepresentation of communities of color in the Sunday shows' climate discussions becomes apparent when you consider that non-white and/or Hispanic/Latino people constitute 39 percent of the U.S. population according to census data. People of color should also have more of a voice on the shows because they tend to bring different perspectives: They are more concerned about climate change than whites and more likely to say they feel its impacts, according to a 2015 survey and other polls. A 2015 poll of African Americans found that 60 percent ranked global warming as a serious issue, and 67 percent said that actions should be taken to reduce the threat of global warming. And a 2017 survey found that 78 percent of Latinos were worried about global warming, compared to 56 percent of non-Latinos. 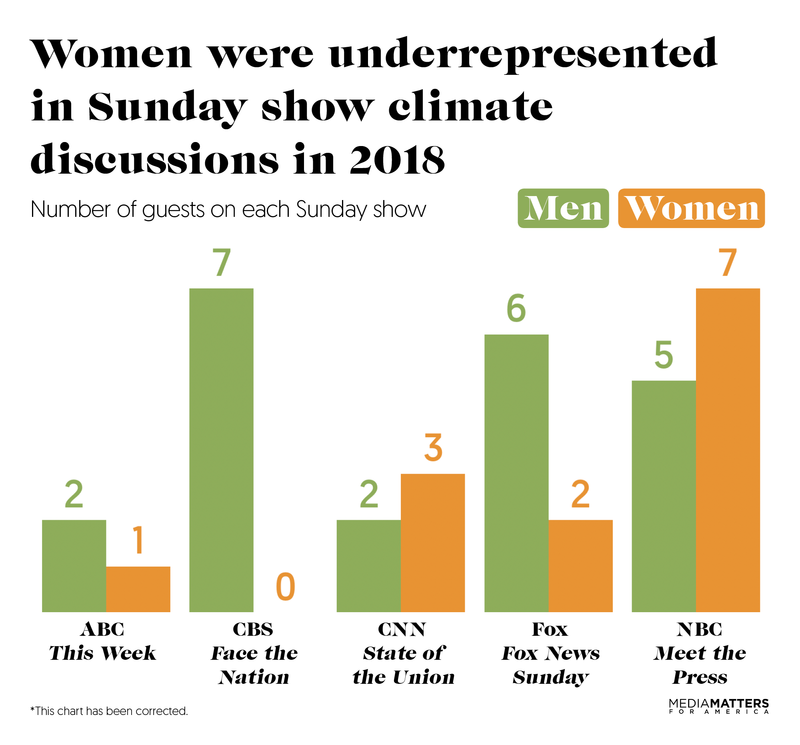 Just 13 of 35 guests who joined in the Sunday news shows' climate discussions in 2018 were women, or 37 percent. Meet the Press led the way this year with seven women, State of the Union followed with three, Fox News Sunday had two, and This Week had one. Face the Nation failed to feature a woman during any of its climate-related segments. This represents a slight increase from 2017 when women were nine of the 35 guests, or 26 percent. Despite the fact that women constitute roughly 51 percent of the population, the trend of males dominating Sunday show guest slots continues, whether they're discussing climate change or any other topic. Again, this leads to a loss of valuable perspective: Polls indicate that American women are more worried about climate change than men. According to a 2015 survey, 69 percent of women in the U.S. are concerned that climate change will affect them personally, compared to only 48 percent of men. And a December 2018 poll found that 71 percent of American women say there's enough evidence of climate change to warrant action, compared to just 61 percent of men. When Face the Nation host Margaret Brennan asked NASA Deputy Associate Administrator Steven Clarke about the National Climate Assessment on November 25, it was the first time in almost three years that a scientist had been included in a discussion about climate change on a Sunday show. The last time it had happened was December 2015, also on Face the Nation. But the discussion between Brennan and Clarke on climate change was brief; most of Clarke's time on the show was spent talking about NASA’s latest mission to Mars. The next month, during a Meet the Press episode dedicated to climate change on December 30, NASA climate scientist Kate Marvel joined a wide-ranging panel discussion about climate challenges and potential solutions. That episode of Meet the Press also featured NBC News' Chief Environmental Affairs Correspondent Anne Thompson on its panel -- the first time a Sunday show has included an environmental journalist in a climate-focused discussion since Media Matters began tracking the guest lineups 2013. Overall, the vast majority of Sunday show guests invited to discuss climate change were politicians, political operatives, or political journalists. 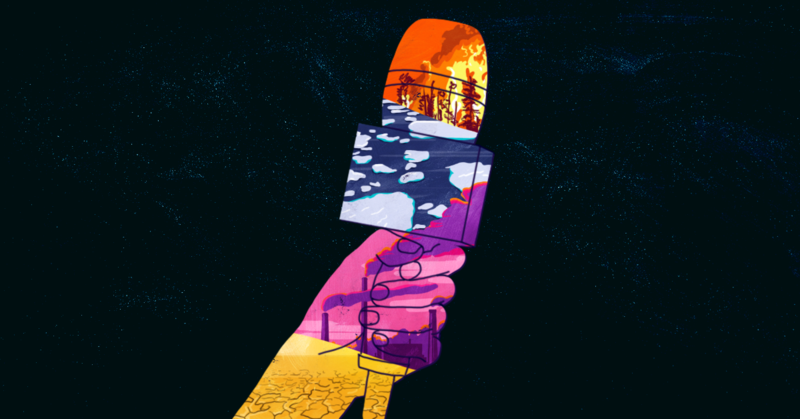 On the few occasions when the Sunday shows did address climate change in 2018, the discussions were often superficial and sometimes featured climate denial or other inaccurate statements, failing to give viewers the substantive, fact-based coverage they deserve. For example, after the Trump administration tried to bury a major government report, the National Climate Assessment, by releasing it the day after Thanksgiving, all five major Sunday shows covered climate change on the same day for the first and only time all year, on November 25. But the quality of much of that coverage was bad. Some of the hosts, including Meet the Press’ Chuck Todd and State of the Union’s Dana Bash, invited climate deniers to discuss the report, allowed them to make false statements, and failed to offer any meaningful pushback. Others, such as This Week’s George Stephanopoulos, spent only a little time on the report. When the shows did include people of color or women in their climate change discussions, that didn't necessarily mean the discussions were good. For example, when Sen. Marco Rubio (R-FL), a Cuban-American, answered questions about climate change on Face the Nation, he suggested that policy solutions would destroy the economy or not be effective. And when Danielle Pletka of the American Enterprise Institute joined in a panel discussion about climate change on Meet the Press, she falsely claimed that the previous two years had been among the coldest on record -- comments so blatantly wrong that the fact-checking website PolitiFact dedicated a post to declaring them "false." Meet the Press took the unprecedented step of dedicating an entire episode to climate change on December 30, its last episode of 2018. It aired about a month after host Todd was widely criticized for allowing Pletka to make false claims on the air and then failing to push back against them. Seemingly chastened, Todd opened the episode by saying, "We're not going to give time to climate deniers. The science is settled, even if political opinion is not." The show featured five segments and seven guests, including outgoing Rep. Carlos Curbelo (R-FL), who had introduced legislation to price carbon earlier in the year, as well as outgoing California Gov. Jerry Brown (D) and former New York City Mayor Michael Bloomberg (I), both of whom have made fighting climate change a signature issue. This episode was the high point of an otherwise dreary year for climate coverage. Without it, Sunday shows would have only aired 22 climate-focused segments featuring 28 guests in 2018, down from 31 segments featuring 35 guests in 2017 -- and Meet the Press would have tied for the lowest number of segments in 2018. In 2018, which was one of the warmest years on record and saw numerous climate-related disasters, the amount of climate change coverage and the quality of that coverage should have gone up, not down. A pair of major reports released in the latter part of the year put our current situation in stark relief. In October, the U.N. Intergovernmental Panel on Climate Change published a study that found if global average temperatures rise more than 1.5 degrees Celsius above pre-industrial levels, hundreds of millions of people would be at increased risk of climate change impacts such as flooding and extreme heat. In late November, the U.S. government put out the latest installment of the National Climate Assessment -- a 1,500-page, congressionally mandated document produced by some 300 scientists from 13 federal agencies -- that painted a dire picture of how climate change is already affecting the U.S. and how its catastrophic impacts will intensify in coming years. Meet the Press’ climate-focused episode demonstrated that Sunday shows can give the topic the serious attention it deserves, with guests who are well-informed about the problem and potential solutions. But this kind of substantive coverage needs to be sustained and incorporated into all of the Sunday shows week after week. 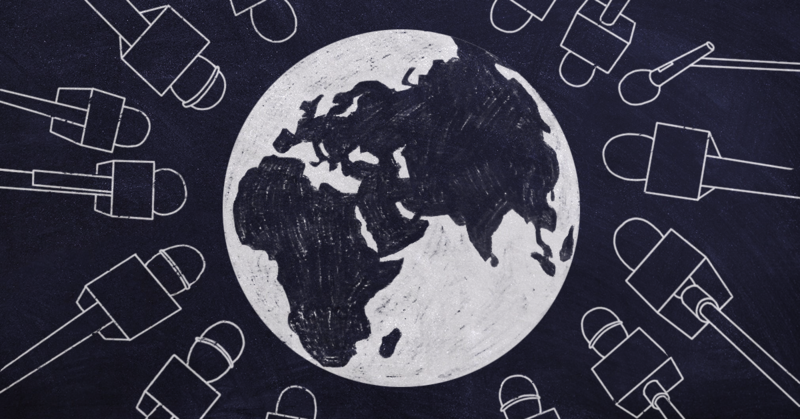 And the coverage must include a broader array of guests -- scientists and environmental journalists who can explain the nature of the challenge, and people of color and women who are on the frontlines of climate change and are pioneering solutions to the crisis. Ted MacDonald contributed research to this report. Charts by Melissa Joskow. This report analyzes coverage of climate change in 2018 on five Sunday morning news shows: ABC's This Week with George Stephanopoulos, CBS' Face the Nation, CNN’s State of the Union, Fox Broadcasting Co.'s Fox News Sunday, and NBC's Meet the Press. To identify segments that discussed climate change, we searched for the following terms in Nexis: climate change, global warming, changing climate, climate warms, climate warming, warming climate, warmer climate, warming planet, warmer planet, warming globe, warmer globe, global temperatures, rising temperatures, hotter temperatures, climate science, climate scientist, paris climate, climate accord, paris accord, climate agreement, paris agreement, and climate deal. 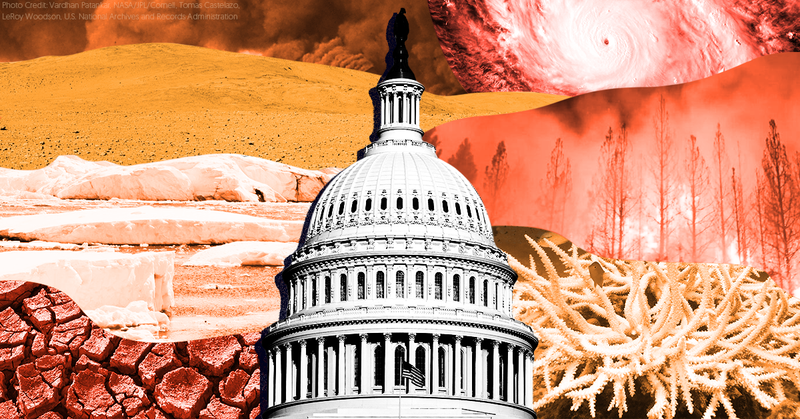 Our analysis included any segment devoted to climate change, as well as any substantial mention of climate change (more than one paragraph of a news transcript or a definitive statement by a media figure). The study did not include instances in which a non-media figure brought up climate change without being prompted to do so by a media figure unless the media figure subsequently addressed climate change. We defined media figures as hosts, anchors, correspondents, and recurring guest panelists. Correction (3/5/19): This piece originally omitted one white woman who appeared as a guest on the November 25 episode of Meet the Press. The text and charts have been updated to reflect her appearance. Foreign media outlets keep showing how to cover politics in the age of Trump. Will U.S. outlets learn their lesson? Access journalism and softball interviews fail the American people. U.S.-based media need a reality check. Dale, who is known for his meticulous fact checks on Trump’s statements to the press and at rallies, was right: The interview with The Daily Caller was riddled with unchallenged errors and nonsensical statements. For instance, he lied about his border wall and about his attempts to repeal the Affordable Care Act. He claimed that undocumented immigrants were voting in California and that Massachusetts residents had been bused into New Hampshire during the 2016 election, flipping the state to Hillary Clinton’s favor. He accused people of voting twice by putting on disguises and changing clothes and, as is almost always the case, he also peppered his responses with half-truths and exaggerations. Maybe U.S. outlets, including mainstream organizations, simply aren’t up to the task of holding the powerful accountable. The Daily Caller has a conservative bent, so it shouldn’t come as a surprise to anyone that this was a friendly interview. After all, one of the two people conducting the site’s interview with Trump was “lib-owning” enthusiast Benny Johnson, a serial plagiarist and publisher of conspiracy theories. But it’s not just the Daily Callers, Fox Newses, and Breitbarts of the world that give members of the Trump administration and its surrogates a pass. Even the most mainstream, nonpartisan news outlets in the country often let the administration spread rumors and outright misinformation during interviews without follow-up. For example, take a look at Trump’s October interview with The Associated Press. At one point, an AP interviewer asked if Trump had any plans to pardon Paul Manafort, his former campaign chairman. During his response, which trailed off into a comment on Russians who had been indicted for hacking Democratic National Committee emails, the president said, with absolutely zero proof or explanation, “Some of [the hackers] supported Hillary Clinton.” Rather than question him about this bombshell accusation, the interviewers moved on to their next subject: Treasury Secretary Steven Mnuchin’s planned trip to Saudi Arabia. At another point in the interview, Trump repeated well-known lies about a law requiring the U.S. to separate undocumented children from their parents at the border and another about members of the military receiving a raise for the first time in 11 years. On both occasions, there was no pushback from the interviewers. Another example comes from Trump’s recent on-camera interview with Jonathan Swan and Jim VandeHei of Axios. During the outlet’s November 4 HBO special, Swan asked Trump about his campaign promise to end birthright citizenship, as guaranteed by the 14th Amendment (emphasis added). DONALD TRUMP: You can definitely do it with an act of Congress. But now they're saying I can do it just with an executive order. Now, how ridiculous -- we're the only country in the world where a person comes in, has a baby, and the baby is essentially a citizen of the United States for 85 years, with all of those benefits. It's ridiculous. It's ridiculous. And it has to end. But we’re not actually “the only country in the world” with birthright citizenship. While Axios does note on its website that there are, in fact, more than 30 other countries that offer birthright citizenship, people who saw the viral Youtube clip likely wouldn't know this, as neither Swan nor VandeHei corrected the false statement at the time. Last week, a video of journalist Mehdi Hasan interviewing Trump campaign adviser Steven Rogers accumulated millions of views on social media. The video shows Hasan, who hosts UpFront and Head to Head on Al-Jazeera English and writes a column for The Intercept, asking a series of questions about: birthright citizenship, Trump’s claim that there were riots in California, and a frequent Trump lie about American Steel announcing plans to open new plants in the U.S. when it has done no such thing. Unlike the aforementioned examples of journalists passing on the opportunity to push back on false statements in real time, Hasan continued following up on the same issue until he got something resembling an honest answer out of Rogers. MEHDI HASAN: He said during the campaign that there’s six to seven steel facilities that are going to be opened up. There are no -- U.S. Steel has not announced any facilities. Why did he say they’ve announced new facilities? That’s a lie, isn’t it? STEVEN ROGERS: No, it isn’t, because there are a lot of companies opening up -- there are steel facilities that are going to be opening up or I think they actually, one opened up in Pennsylvania. HASAN: Sorry, Steven, that’s not what he said. I know it’s difficult for you. I know you want to try and defend him. ROGERS: No, it isn’t difficult for me. HASAN: Well OK, let me read the quote -- let me read the quote to you. “U.S. Steel just announced that they’re building six new steel mills.” That’s a very specific claim. U.S. Steel have not announced six new steel mills. They have said they’ve not announced six new steel mills mills. There’s no evidence of six new steel mills. He just made it up. And he repeated it. He didn’t just say it once. HASAN: The American people can be doing well, and the president can be a liar. There’s no contradiction between those two statements. ROGERS: I am not going to say the president of the United States is a liar. I’m not going to do that. HASAN: No, I know you’re not! But I’ve just put to you multiple lies, and you’ve not been able to respond to any of them. It’s not a matter of partisanship, either. In the past, Hasan has grilled Obama administration deputy national security adviser Ben Rhodes over U.S. intervention in Syria and Obama adviser Derek Chollet on the former president’s foreign policy legacy. It says a lot about the state of U.S. journalism that Hasan’s clip got attention for just being the type of interview journalists everywhere should be conducting. “Journalist Mehdi Hasan Brilliantly Grills Trump Official On President’s Lies,” read one HuffPost headline. “Al Jazeera Host Pummels Trump Adviser With Examples of His Lies: ‘The President Lies Daily,’” read another over at Mediaite. If journalists are posing tough but factual questions, then who cares how conservatives -- or liberals, for that matter -- feel about that? U.S. conservatives, of course, have a long, tried-and-tested history of 'playing the ref' and pressuring media organizations to soften their coverage with bad-faith accusations of liberal bias. One way around this is for interviewers to establish reputations for being tough with politicians from across the spectrum. Only a handful of U.S. cable news interviewers do this -- Jake Tapper and Chris Wallace, off the top of my head. But they're still not tough enough -- especially with Trump administration officials and supporters who like to tell brazen lies live on air. But being a tough interviewer isn’t without its downsides. For instance, in June 2016, CNN’s Jake Tapper interviewed then-candidate Trump. Tapper grilled Trump about his comments that Judge Gonzalo Curiel -- who was presiding over a case involving Trump University -- had a conflict of interest in the case because his parents were Mexican immigrants and Trump wanted to build a wall between the U.S. and Mexico. The interview, which aired during the June 5 edition of State of the Union with Jake Tapper, left Trump looking foolish and unable to defend his Curiel comments. The interview was hard-hitting. Trump has not given another interview to Tapper in the more than two years since. Hasan has thoughts about how journalists can avoid the access trap, but it involves a bit of teamwork. He wrote: “Unless all interviewers toughen up their act, it'll be very easy for politicians to pick and choose between tough and soft interviewers and decline requests from the former.” That is to say, journalists all need to up their games. He and his team on UpFront devote a lot of time to researching the people and issues they plan to discuss in advance. The team will watch past interviews the guest has done to see “what works and what doesn’t.” Importantly, they think realistically about how much ground an interview can or should cover in the time allotted. It’s an important question: Is it better to cover a dozen topics with zero follow-up questions, or does it make more sense to really drill down on three or four questions? The answer is probably the latter. On-air interviews are rare opportunities for politicians to show how brave they really are. Voters should expect elected officials to take risks and to be able to defend their positions in unscripted environments. Interviews on television are one of the few times that a politician has his or her feet held to the fire in a sustained or coherent way. Print interviews tend to be softer, and done in private. TV debates between candidates tend to be an exchange of hackneyed and partisan talking points. A TV interview is an opportunity to perform a robust interrogation of a politician's views, positions, policies and statements. If it's not probing and challenging, what's the point of it? Why bother doing it? News consumers and voters should encourage politicians to take on the toughest interviewers they can find. Politicians who can’t explain and defend their policy positions are politicians who probably shouldn’t hold office at all. So long as interviewers are fair, fact-based, and focused on relevant issues, there’s no reason a tough interview isn’t also one that can win over both skeptics and supporters. Friendly interviews have their place, but they’re not especially helpful when it comes to giving voters the information they need to make informed choices about who they want representing them. Unfortunately, we’ve come to expect that presidents and other politicians will seek out the easiest, most slam-dunk interviews they can book. For instance, during the 2016 campaign, the Trump campaign forged an agreement with Sinclair Broadcast Group to air exclusive (and exceptionally friendly) interviews with Trump. The 2016 election demonstrated not just that candidates were afraid to take the risk of engaging in difficult interviews, but also that journalists were afraid to offer them. A study by Harvard Kennedy School’s Shorenstein Center on Media, Politics and Public Policy found that during the 2016 presidential election, there wasn’t a whole lot of policy being discussed. According to the report, 42 percent of all election media reports were dedicated to horse race coverage, with 17 percent focused on controversies. Just 10 percent of all election coverage was centered on policy issues. Perhaps news and entertainment have become too intertwined, with too much focus on viewership and not nearly enough emphasis on what should be the primary goal of informing the American people. Infotainment simply does not make for an informed electorate, and it’s a shame that we live in a world where interviews like Hasan’s are the exception and not the rule. Climate change should have been a topic in every election debate this year. The U.S. was pummeled by extreme weather in 2018, and climate scientists are telling us that climate change is the big reason why. Voters deserved to know what, if anything, candidates propose to do about the problem. That percentage is up a little from 2016 -- when only 22 percent of debates in key competitive races included a question about climate change -- but it's still far too low. Yet we did spot a few encouraging trends. After October 7, when the U.N. Intergovernmental Panel on Climate Change (IPCC) issued a major report about the urgent need to address the climate crisis, many more moderators and panelists asked about climate change. Only 7 percent of debates (2 of 27) included a climate question before the release of the IPCC report. After the report came out, 43 percent (21 of 49) included a climate question -- a marked improvement. Nearly half of those questions directly referenced the report. The journalists serving as moderators and panelists clearly recognized the importance of the IPCC's warning and became more attuned to the urgency of the climate crisis. We hope this attention to climate change will carry forward and inform their reporting in the future. We also found that many voters pushed for climate questions to be included in debates, in red and purple states as well as blue ones. At the first Indiana Senate debate on October 10, moderator Anne Ryder, a senior lecturer at Indiana University's Media School, brought up the topic of climate change and said, "I’ll tell you, we’ve received more questions on this than any other topic." In the next debate in the race, a few weeks later, moderator Amna Nawaz of PBS NewsHour told the candidates that several voters had not been satisfied with the answers they gave previously and asked them to detail specifically what they would do to combat climate change. In a Colorado gubernatorial debate on October 23, moderator Nic Garcia, a political reporter for The Denver Post, introduced a question about climate change by saying, "When we asked readers and viewers for questions, overwhelmingly this was the No. 1 topic on their mind." And at an Arizona Senate debate and a Wisconsin gubernatorial debate, moderators asked climate questions that had been submitted by members of the public. Ahead of an October 21 Florida gubernatorial debate, citizen activists announced that they were going to press moderator Jake Tapper of CNN to ask a question about climate change. But Tapper caught wind of their plans and tweeted that there was no need; he already knew that climate change was a notable topic. He then made it the subject of his first question at the debate. Rep. Jared Polis, Democratic candidate for governor in Colorado, said that voters asked him about climate change more than reporters did. "Climate change and environment are a lot more on the minds of people that I meet, and I've had over 300 meet-and-greets in all parts of the state," he said during an interview on November 1. When moderators did ask climate questions during debates, the candidates often revealed dramatically different views on the issue -- important information for voters to know. During the October 16 Texas Senate debate, for example moderator Jason Whitely, a reporter at WFAA-TV in Dallas, asked Republican Sen. Ted Cruz about his history of climate change denial. Cruz responded by saying, “The climate has been changing from the dawn of time. The climate will change as long as we have a planet Earth.” Whitely pushed Cruz to clarify his views on climate change, but Cruz again dodged the question. When his turn came, the Democrat in the race, Rep. Beto O’Rourke, said, “Look, the climate is changing, and man-made climate change is a fact. Three hundred years after the Enlightenment, we should be able to listen to the scientists and follow their advice and guidance. And they tell us that we still have time, but the window is closing to get this right." At the Arizona Senate debate on October 15, moderator Maria Polletta, a reporter for The Arizona Republic, asked Democratic Rep. Kyrsten Sinema and Republican Rep. Martha McSally about climate change. Sinema responded by explaining that she wants to work on water issues and said, "I firmly believe that as Arizonans, as Americans, we have the resources, we have the tools, we have the skills, and we have the knowledge. We can address issues of climate change together, and do so without harming our business prospects and without harming what makes Arizona so amazing." McSally, in contrast, was scornful of the topic. "I can’t believe this is the last question," she said before changing the subject. With the 2018 election season coming to a close, we need journalists to further ramp up the focus on climate change. As new governors and members of Congress take their seats, they will have to make critical decisions about a rapidly changing electricity system, transportation networks, agriculture and land-use practices, and ways to make our communities more resilient in the face of disasters. Reporters should ask elected officials how climate change will factor into those decisions. And when the 2020 campaign season gets rolling, journalists and media outlets will have a crucial role to play in making sure that climate change is discussed in races from the local level all the way up to the presidency. As the recent IPCC report warned us, there's no more time to waste. Jake Tapper fact checks Trump's fearmongering about migrant caravan: "The president's spreading falsehoods in rapid fashion"
This page was updated on November 6, 2018, after the completion of all debates. 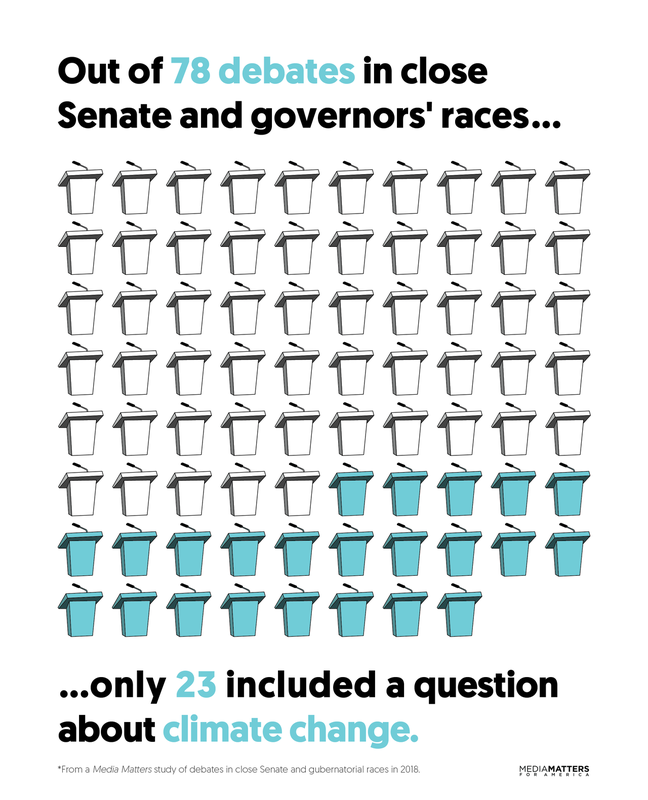 Out of 78 key Senate and gubernatorial debates this year, only 23 featured a question about climate change, or 29 percent. Media Matters analyzed debates in close Senate and gubernatorial races to determine whether a moderator or panelist asked the candidates a climate question. This year's percentage was a modest improvement over 2016, when only 22 percent of key debates we analyzed included a moderator's or panelist's question about climate change. The percentage of debates this year that included a climate question went up dramatically after October 7, when the U.N. Intergovernmental Panel on Climate Change issued a dire report explaining the extreme urgency of fighting climate change. In debates before the report came out, only 7 percent included a climate question. In debates after the report was released, 43 percent included at least one question about climate change from a moderator or panelist. For more analysis, see this post. For debates that featured a climate question, we have included video clips of the questions and answers below (and in some cases, links to transcripts). For all debates, we have listed the moderators, panelists, and sponsoring organizations, and posted links to full debate video or audio. Climate threats: Alaska is at risk from extreme heat, coastal flooding, and wildfires, among other threats. Climate questions: The moderator did not ask any climate-related questions. Climate questions: The moderators did not ask any climate-related questions. Climate questions: There were no climate-related questions asked during the debate. Climate threats: Arizona is at risk from extreme heat, drought, and wildfires, among other threats. Climate threats: Colorado is at risk from drought and wildfires, among other threats. Climate questions: The moderator and panelists did not ask any climate-related questions. Climate threats: Connecticut is at risk from inland flooding and coastal flooding, among other threats. Climate threats: Florida is at risk from extreme heat, inland flooding, and coastal flooding, among other threats. Climate threats: Georgia is at risk from extreme heat, wildfires, inland flooding, and coastal flooding, among other threats. Climate threats: Illinois is at risk from extreme heat, drought, and inland flooding, among other threats. Climate questions: The moderators and panelists did not ask any climate-related questions. Climate threats: Indiana is at risk from extreme heat, drought, and inland flooding, among other threats. Climate threats: Iowa is at risk from drought, inland flooding, and extreme heat, among other threats. Climate threats: Kansas is at risk from extreme heat, drought, wildfires, and inland flooding, among other threats. Climate threats: Maine is at risk from extreme heat, drought, coastal flooding, and inland flooding, among other threats. Climate questions: The moderator did not ask any climate-related questions, despite the fact that the debate was focused on the topics of energy and the environment. But the candidates did address climate change in their answers to some questions. Climate questions: The moderator and panelist did not ask any climate-related questions. Climate threats: Michigan is at risk from extreme heat, drought, and inland flooding, among other threats. Climate threats: Minnesota is at risk from drought and extreme heat, among other threats. Climate threats: Missouri is at risk from extreme heat, drought, and inland flooding, among other threats. Climate questions: The moderator and panelists did not ask any climate-related questions, although an audience member did. Climate questions: The moderators did not ask a climate-related question. Climate threats: Nevada is at risk from drought, extreme heat, and wildfires, among other threats. Climate threats: New Mexico is at risk from extreme heat, drought, and wildfires, among other threats. Climate threats: North Dakota is at risk from extreme heat and inland flooding, among other threats. Climate threats: Ohio is at risk from extreme heat, drought, and inland flooding, among other threats. Climate questions: There were no climate-related questions asked during the townhall. Climate threats: Oregon is at risk from drought, wildfires, extreme heat, coastal flooding, and inland flooding, among other threats. Climate threats: Rhode Island is at risk from extreme heat, coastal flooding, and inland flooding, among other threats. Climate threats: Tennessee is at risk from extreme heat, drought, inland flooding, and wildfires, among other threats. Climate threats: Texas is at risk from extreme heat, drought, coastal flooding, and wildfires, among other threats. Climate threats: West Virginia is at risk from extreme heat and inland flooding, among other threats. Climate threats: Wisconsin is at risk from extreme heat, drought, and inland flooding, among other threats.